Annan were outgunned at Galabank after substitute Craig Gunn came off the bench to score a dramatic late injury time equaliser to knock Annan back off the top perch in league 2. Annan looked to be heading towards victory until ex Annan player Jordan Halsman delivered the telling cross which Craig Gunn headed home from 4 yards in time added on for an injury sustained to Bryan Gillfillan. It was a cruel blow for Annan to take when they looked like seeing the match out but after Gunn’s late eqauliser the Annan defence had to withstand a late barrage by the visitors as they went all out to secure victory. The first half was a hard fought match played in perfect conditions for football, opportunities were few and far between with both defences giving very little away but Annan will rue the opportunity squandered in the 34th minute when Smart Osadolor headed wide of the target from Watson’s cross to the back post. It was a golden opportunity missed but Annan went ahead minutes later when Steven Black’s header from Rabine Omar’s corner found the top corner of the net. It was a rare moment in the match when the Elgin defence failed to pick up the unmarked Black with so much space. It was the only opening in a half where scoring opportunities were rare Kyle McLeod went close in the 18th minute when his overhead kick landed on the roof of the net. Daniel Moore’s 23rd minute free kick in a promising position was easily saved by Hart. Gillfillans 26th minute effort went past the post and in the 30th minute Elgins best opportunity of the half fell to Archie McPhee who shot narrowly past the post after a dangerous move down the right. Elgin started the second half on the attack with a penetrating Daniel Moore run along the bye line by a timely Black interception averted a potentially dangerous situation. 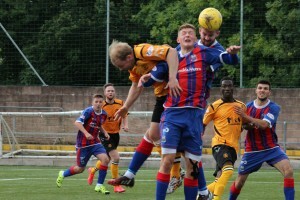 Annan started to impose their authority on the game with the Elgin defence being stretched in an anxious opening period as Annan forced three corners. Annan’s Bryan Gillfillan had to be stretchered off with a bad gash to the top of his head in the 57th minute with Peter Weatherson being introduced. Conor McLaren finished a penetrating run down the right with a dangerous ball across the face of the goal opened up the Annan defence but there was nobody there to pick up the excellent cross. Jordan Hart then saved low down to deal with a dangerous Daniel Moore cross. Osadolor and Flynn then combined well to open up the visitors defence to set up Josh Todd but the final low shot from Todd did not seriously test Mark Hurst in the Elgin goal. Moore then skied over the bar at the other end before Mark Mackenzie was introduced in the 68th minute. It proved to be an inspired substitution and in the 79th minute Mackenzie was unlucky to see his shot crack against the top of the post . Flynn went close when his effort went narrowly past the post in the 84th minute. Swinglehurst conceded a free kick wide on the right and from the ensuing free kick substitute Craig Gunn headed over the bar. The game entered the time added on as a result of the injury to Gillfillan and there was a final twist to unfold when Jordan Halsman collected a fortunate deflection to send in a low cross perfectly placed for Craig Gunn to head home from 4 yards. The goal spurred on Elgin and Halsman then almost scored the winner when his low cross went narrowly past the post. It was a keenly contested game between two evenly matched teams and Elgin did enough to secure the point , Annan looked to be capable of seeing the match out until the late substitutions by Elgin were influential in the late goal. 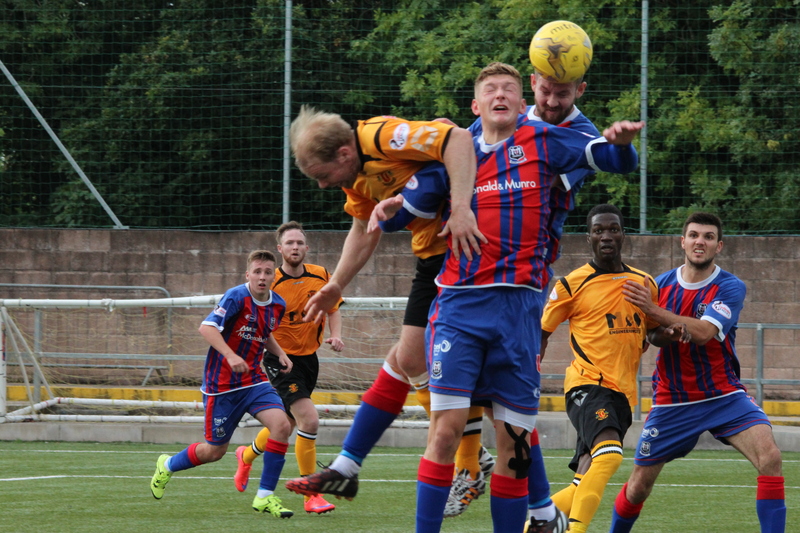 The point was not enough to keep Annan at the top of the table after convincing away wins by East Fife over Montrose and Queens Park over Stirling Albion ensured that both these sides leap frogged both these teams above Annan Athletic. With one game to go before the league reaches the quarter stage there is still no team running away with the league with 3 points separating 6 teams. The signs are that this will be as closely contested league as there has been in recent years. ANNAN ATHLETIC: Jordan Hart, Steven Black, Steven Swinglehurst, Martin McNiff, Peter Watson, Steven Sloan, Rabin Omar , Mathew Flynn , Bryan Gillfillan (Peter Weatherson 58 min), Josh Todd ,Smart Osadolor. SUBS NOT USED: Blair Currie GK ,David Ferguson, Greig Macdonald, Ryan McStay, Scott Norman, Jamie Watson. ELGIN CITY :Mark Hurst, Mathew Cooper, Daryl McHardy, Liam Gordon, Jamie Duff, Archie McPhee (Mark Mackenzie), Conor McLaren (Craig Gunn 68 min), Brian Cameron, Kyle McLeod, Thomas Reilly, Daniel Moore (Jordan Halsman 84 min). SUBS NOT USED: Cieran McLean, Robbie Bruce, Stewart Black GK. REFEREE: Grant Irvine . ASSISTANTS John McCrossan and Craig Walker.